Ever have on of those days? Perhaps it feels like one of the those lives?! 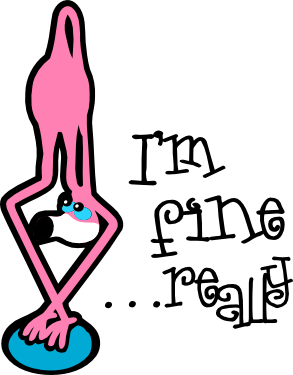 I have a flamingo collection and thought I should finally get around to designing a few...the saying I've included with this will be provided as it's own file as well so you can use it with other images. I have it on a mug with a cow on it's back and feet straight up...may have to create a similar cut image of that, too! At any rate here's my first silly flamingo...in case you can't tell that's what it is! I have the small white part of the eyes and beak included but it is easier to just put a scrap piece of white paper behind the black outline for those elements. The small colored eye parts are a little tricky getting just right but they do add some dimension to the eyes. Sorry for the delay in posting the file, (second post)...link here! Thank you so much for sharing your wonderful files. I love the onsies. The flamingo is great also. Thanks Bobbi! It's a lot of fun to design!